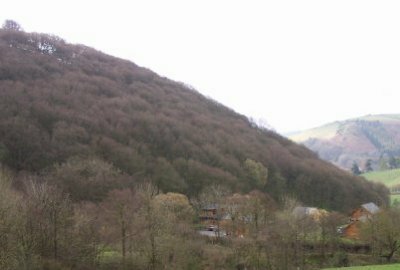 Holiday at Black Hall Lodges, Knighton, Shropshire. Family holiday at Black Hall Lodges - All lodges complete with a hot tub. This is the only holiday destination that we have ever returned to for both short breaks and week long holidays. Me, my husband and our two children, aged five and nine, all like our home comforts and we don't want to go without whilst on holiday. But our third visit to Black Hall Farm which is situated on the Shropshire and Welsh borders, promises even more this holiday, due to the recent opening of their new leisure suite. At the moment there are just six luxurious lodges which are tucked on the side of a hill on this working organic farm, which is situated in easy walking distance to the top of Offa's Dyke. The lodges are individually designed from solid Canadian logs. They are spacious and very well appointed with everything you would expect to find in the kitchen, including a fridge/freezer, washer/dryer and a dishwasher. Each lodge has central heating and a wood burning stove, but to top it all, you have your own hot tub on a private veranda, with truly spectacular views over the countryside. The lodges range is size from one bedroom lodges which sleeps 2-4, right up to three bedroom lodges which sleep seven people. On this short break holiday we stayed in the Superior Lodge which sleeps up to seven. The downstairs area is open plan with a fully fitted kitchen, dining area and a spacious lounge, complete with leather settee and flat screen TV with some sky channels and DVD player. Also on the ground floor is a shower room, a twin bedded room and the master bedroom with a grand four poster king-size bed. Our son claimed the upstairs area, which consists of a spacious galleried bedroom overlooking the lounge with a beautiful cast iron detailed double bed, and a single bed. There is also an upstairs bathroom. The bedrooms all have incredibly comfortable beds and lots of storage space. The lodge is full of original pieces of furniture and art work, which sets this destination apart from other holiday homes. The farm and lodges are family run. We have always found the owners to be incredibly friendly and helpful without being in the least obtrusive. There are six further lodges currently under construction, which are planned to be ready for Easter 2010. These new lodges are of a Scandinavian design, and each will have its own private sauna as well as a hot tub. The new leisure suite has been built and furnished to the same high standards as the lodges. It features an indoor pool with under floor heating, a sauna and steam room. Upstairs there is a small gym area which the owners have called a gentle exercise room, next to a seating area where Wi-Fi access is available. Our children loved the adjoining games room which contains a soft play area, table tennis, pool table, darts, table football as well as a chill out area with a large flat screen TV. An outside children's play area is soon to be completed. On our previous visits to Black Hall, we have been on many day excursions to places in the surrounding area, such as Welshpool, Newtown, Ludlow, Leominster, Hereford and Hay-On-Wye. However, it has to be said that the roads around this area, whilst very scenic, aren't really very agreeable with our children. So our holiday always includes a day of walking along footpaths from the farm, and sitting in the hot tub reading a book or just gazing at the sheep and cows reared here (organic ones sold at Waitrose, Tesco and Sainsburys). You will need wellies and rain coats, as there can be a real variety of weather over the course of a short break here. On previous occasions we have watched snow fall as we sat snugly in the bubbling forty degree hot tub. But there are real adventures to be had by children and some serious relaxing to partake in by the adults. We will be booking our 4th holiday here again next year, once we return home. Should Black Hall Lodges not be to your liking, but you fancy staying in the area around Shropshire, you might well be interested in the lodges below. All these lodges are within a few miles of Black Hall Lodges.